"So, this bunch of barbarians was coming from over there..."
Yesterday a dozen or so people from Turku City Library bicycled to Lieto, to a historical site called Vanhalinna. It’s a pretty weird looking big rock sticking out of the flat ground, a bit like Uluru or something. Anyway, there used to be an important fortress when these parts of the world were coming to iron age. 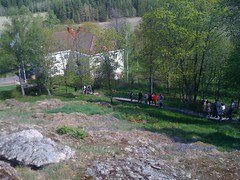 The big hill used to be and island of the archipelago. But now the sea has retreated quite a bit and a new fortress was built around the 13th centuy. This new fortress is the Turku Castle. There is also a mansion next to the big rock. 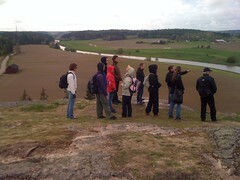 The site is administered by a foundation, and part of the Turku University. They have an interesting museum there, with several historical exhibitions and art exhibitions too. Museums and museum-people fascinate me (remember, they are our sisters and brothers), so i had a little chat with a member of the staff there (aargh i didn’t catch her name). I asked about their cataloguing work, and she told me so far they have catalogued objects, and also would like to catalogue all the buildings in the area. We talked some stuff about education to become librarians and museum-people. Then we also talked about collection management in museums and libraries… and soon we were talking about KDK, (Kansallinen digitaalinen kirjasto, National Digital Library of Finland). KDK is a bit special because in addition to libraries, it has museum and archive colletions in it too, all in a unified user interface… it’s a bit like a national Europeana really. Anyway i told her about those KDK and Europeana, and she said they are now converting their database so they can join Musketti, a database system for finnish museums… then KDK too. This is great, because i am currently working here in Turku to prepare KDK so that it will be suitable for the Vaski-consortia in this area and for finnish public libraries in general. I want to help the Linnavuori museum-people to join KDK if i just can! The bicycling trip was about 20km, so it’s a great little daytrip if you want to visit a nice, interesting site close to Turku. Thanks to Krisse, our excellent guide who told us a lot of interesting stuff about the site, thanks the museum-person for chats and also to everyone who joined the tour.